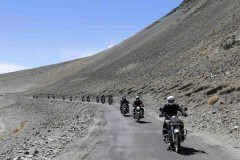 Go motorbiking on the national highways and mountain passes of Ladakh on a 9-day motorbiking tour. With powerful Royal Enfield motorbikes on hand, you'll roar through the Ladakhi range, with an entourage of like-minded motorbikers and an experienced support team. Surrounded by barren and arid hills as far as the eye can see, you'll travel to distant destinations in Ladakh, having new adventures and clicking picture-perfect photos. Your adventure begins in the state capital of Srinagar. As you travel east to Ladakh, you'll visit the historic city of Kargil before arriving at Leh. After exploring Leh and the sand dunes of the Nubra Valley, you'll spend a night by the famous Pangong Lake and return to Leh, ending the tour with unforgettable experiences. Arrive in Srinagar and convene at a pre-determined meeting point. In the afternoon, you'll meet your fellow motorbikers and your road captain for a brief orientation session to discuss the climate conditions, itinerary and other details of your upcoming motorbiking adventure. In the evening, test ride your allotted motorbikes and visit the city's famous Dal Lake. Overnight in a hotel at Srinagar. Leaving behind the scant greenery of Srinagar, you'll flag off your Ladakh motorbiking trip by heading east on the Srinagar-Leh highway. 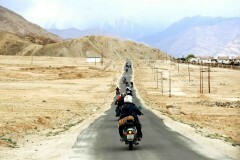 On the horizon, you'll begin seeing some of Ladakh's characteristic barren and brown mountains. 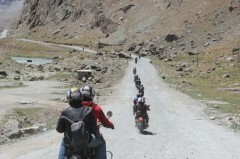 En route to today's destination of Kargil, you'll ride through the tricky turns of the Zojila Pass and cross the village of Drass, the second-coldest inhabited village in the world. You'll also halt to visit the Kargil War memorial, dedicated to the soldiers of the 1999 Indo-Pak war. Overnight in a hotel at Kargil. In the morning, spend some time on the banks of the Pangong Lake and visit the area featured in the popular Bollywood movie '3 Idiots'. 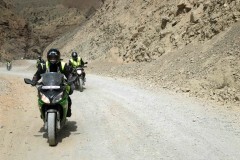 On the last day of your motorbiking adventure, you'll travel back from Pangong to Leh, crossing the high-altitude Chang-La Pass that is often layered with thick snow all over. Overnight in a hotel at Leh. Check-out from your hotel and proceed to your next destination. Your trip ends here. Arrive in Srinagar. You'll be accommodated in a hotel at Srinagar. Today's meal package includes dinner only. In the evening, you can visit the local marketplace in Srinagar to shop for any last minute essentials. Check-out of the hotel. Today's meal package includes breakfast only. Your trip ends here. Srinagar is easily accessible by road, rail, or air, from most domestic and international hubs. You can board a connecting flight from Delhi to Srinagar's Sheikh Ul-Alam International Airport from most major cities in India.